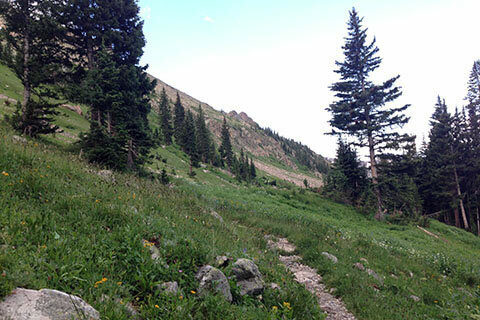 The section of trail that travels above treeline is what makes the Loop route special. 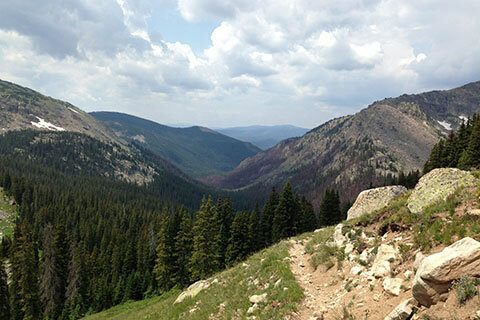 The route is part of the Continental Divide Trail. 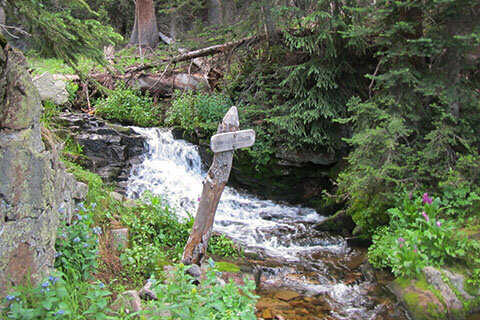 The Loop Trail Guide is divided into three parts - North Inlet Trail, Tonahutu Creek Trail, and the above treeline section of the Loop route. 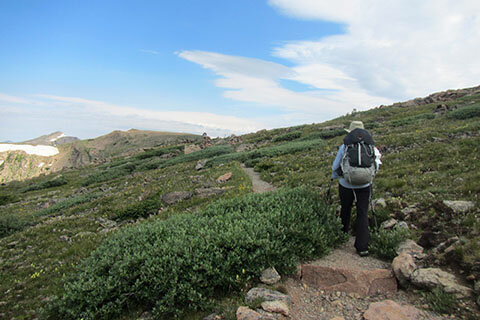 The above treeline section of the route starts at North Inlet Junction and ends at Haynach Lake Trail Junction (or vice versa). There really is no trailhead to this section. You have to walk either the North Inlet Trail of the Tonahutu Creek Trail just to get to the start. We added an abbreviated sections of the North Inlet Trail and the Tonahutu Creek Trail to the Loop route description. Follow the links for more detailed info on the North Inlet Trail and the Tonahutu Creek Trail. Many hikers use the North Inlet Trail and Tonahutu Creek Trail as backpacking destinations without doing the Loop. 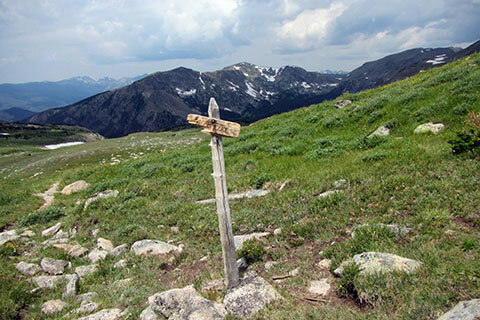 Most hikers do the Loop as a two to four day backpacking trip. Permits are required for overnight stays in the Park. Permits are in high demand for the two month window of the summer when the route is mostly snow free. Reservations are recommended, but you might get lucky. The Park Staff in the Backcountry Office are excellent. Most of the employees seem as if they have walked the trails and are familiar with the areas. They will however, try to discourage you from planning hiking distances of more than ten miles in a day. The route may be walked as a long day hike or trail run, but the honor would only be for fit, acclimated hikers. NO permits are required for day hiking. It would be prudent to make a very early start if day hiking the route. Determine your speed (at altitude and carrying a pack) and estimate your time to complete each segment of the route. Use the figures to calculate an appropriate start time. If backpacking the route, pack carefully. We witnessed several hikers trying to carry big packs up the North Inlet Trail to the Junction and on up toward the Divide. It wasn't a pretty sight! Most of the hikers we met thought we were day hiking because our packs were so small. Bear proof food storage containers are required for camping in the Park. The containers take up a lot of pack space, but make bear proofing the campsite easier. For our basic gear we carried a Hubba Hubba NX tent, ThermaRest Neo Air pads, a shared Western Mountaineering Alder quilt, and Packs - Osprey Talon 44L and Patagonia Ascensionist 45L. We have a lighter tent than the Hubba Hubba, but we chose the Hubba Hubba as a compromise of weight and stability in high winds. We definitely have day hiking the Loop Route on our radar. 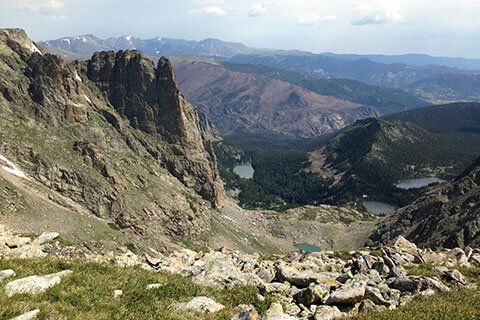 It is also very popular to hike from Bear Lake to Grand Lake as a day hike and to use a (for pay) shuttle to return to the east side of the Park. Upping the ante ... it would be more fun to start at East Portal (near the YMCA) and hike to Grand Lake as a day hike. That would be more like hiking from Estes Park to Grand Lake! Another interesting trip would be to hike to Grand Lake, spend the night in town and then hike back to the east side the next day. When we did the Loop, we initially though it was important to stay the first night as high as possible. We tried to reserve one of the July sites, but had to settle for Pine Marten. The site was about a third of a mile from North Inlet Junction. As we hiked the route, we met hikers going to the July sites. We sort of felt sorry for them. They had heavy looking packs and had a stout climb of over a thousand feet in elevation gain at end of the day. Ouch! We made quick work of the climb to the July sites the next morning and were carrying even lighter packs after consuming the food from our dinner and breakfast at the Pine Marten campsite. We would recommend staying at a site close to North Inlet Junction. Our second night was at Haynach Lake. The campsites were wonderful, but the path to get to the sites was steep. Any of the sites between Timberline (group) and Granite Falls would probably be fine. Renegade is the highest regular (non-group) site. It is a ten mile day from North Inlet Junction to Haynach Lake Trail Junction. Everyone seems to acclimate differently. 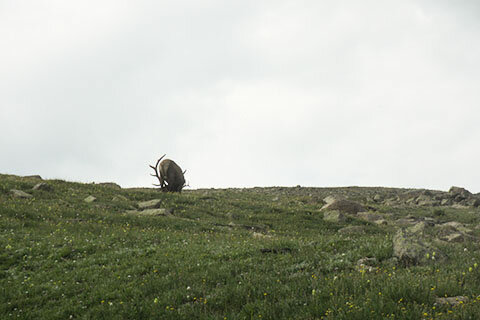 Some hikers don't seem to be bothered by the altitude while others can never catch their breath. It would be prudent to day hike for a couple of days giving your body a chance to acclimate before starting the Loop. I don't do well sleeping high (above 8,500') until I am acclimated. We pay special attention to the altitude of our campsite until we feel acclimated. Others have trouble hiking at that certain altitudes. Your fitness level has little to do with your bodies ability to acclimate. At July campsite the trail starts the climb above treeline. 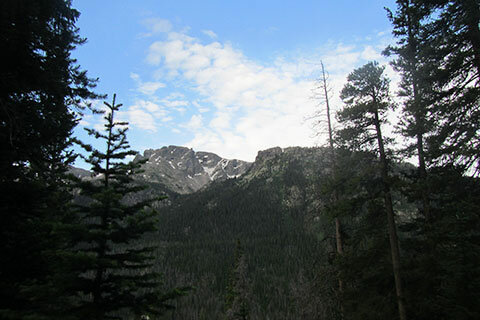 You are above the trees until you return to Tonahutu Creek near the Treeline campsite. Keep a sharp eye out for the weather. The trail is above treeline for over 7 miles. 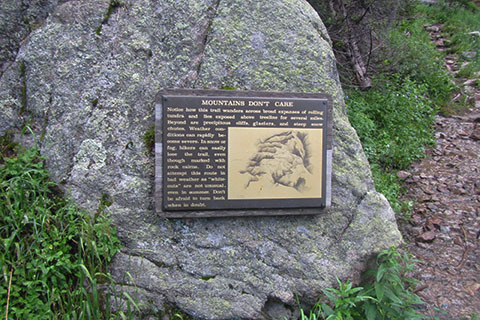 It is 8.35 miles between the "Mountains Don't Care" signs. That's along time when exposed to the weather. Start early! Life in the mountains is best when you start early in the mornings. The early start helps avoid afternoon thunderstorms. Privies are available at all the group campsites, plus ones at Cascade Falls and North Inlet Junction. All water should be treated by an appropriate means. Water was very plentiful on our visit. We could have probably gotten by with one quart of water, but we carried more water so that we did not have to stop and filter. It took us a little less than 3 hours and 45 minutes to travel between the "Mountains Don't Care" signs (8.35 miles), including a visit to the Flattop summit. We took one short break (clouds were forming) and maintained a fairly consistent speed heading both up and down the trail. We did stop and talk to every part that we met or passed. We were at Haynach Lake camp with the tent set before noon. A shower passed over on our approach to Haynach and afternoon storms greeted us at camp. We were happy we departed camp early and made good time crossing the alpine zone. We could not find any sources with matching mileages for trail distances. Some of the mileages we use on cloudhiking might also be slightly wrong. We try to be as accurate as possible. We hike the trails and notice when things are not right. The 0.25 mile red dots on the trail track line gives the hiker a scale on all parts of the trail. It is easy to calculate a rough estimate of the distance to any location on the trail. It is also comforting to know that the scale is the same throughout the map. In other words 0.25 mile at one point on the map is .25 mile at all other points of the map! For the first time on the Loop Map, we started adding green arrows and a distance (green) to signify the distance between a red dot and the end of the section. For example, if the green distance between the final red dot and red star (indicating a waypoint and the end of the segment) was a fraction of the quarter of a mile segment, the green distance would give the determined distance. Note: red dots on the trail track line are reset at each trail junction.